Michelle Johansen is an engaging public speaker and trainer. In addition to having hosted over 120 Women’s Development Forum meetings in Guernsey and Jersey she regularly speaks for professional bodies and companies on a variety of personal development topics. 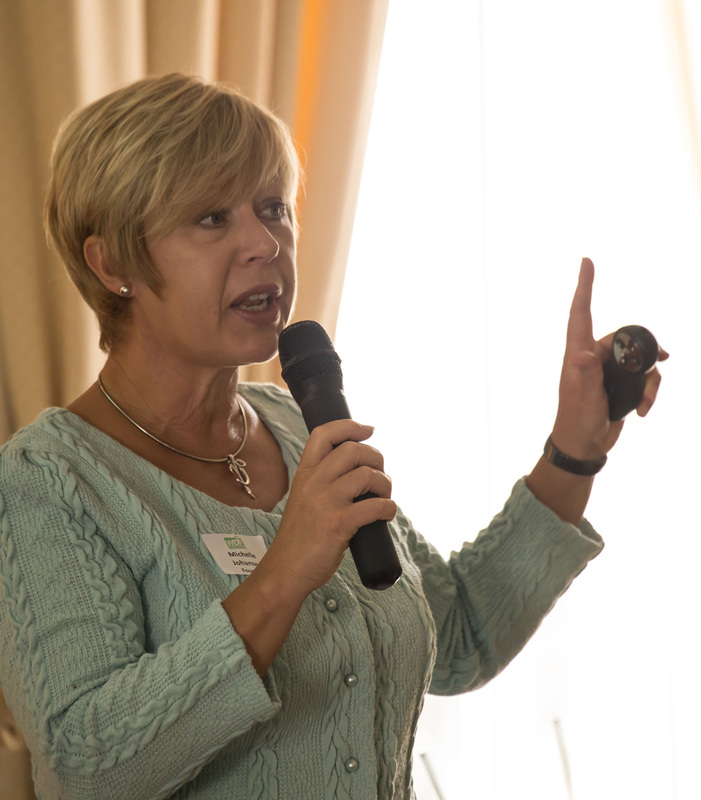 Over the years Michelle has spoken at events for the Chamber of Commerce, Institute of Directors, CIPD, Women at One, U3A, Business Connect and the Jersey Leadership Conference as well as running training courses for private companies and through the Guernsey Training Agency. Each year Michelle offers her services free for a limited number of charitable, professional body and community events. For other engagements she charges a fee for her services details of which can be obtained by contacting michelle@femalepotential.co.uk Michelle’s talks are available from 20 minute to 1 hour, with training courses available in 2 hour, half day and full day packages. Michelle calls herself a feminist and advocates gender equality in many of her talks. However she is keen to engage with mixed gender audiences taking the stance that being pro-women doesn’t mean being in anyway anti-men. The topics below are some of the talks and training sessions Michelle offers. To discuss possible other topics please contact her on the email above, since, as and when time allows, she is happy to design other course materials. Please contact Michelle to enquire about her public speaking service. Typically women cite lack of confidence as a major factor holding them back, while men are often criticised for being over confident. In reality both are unconscious stereotypes which can influence our behaviour in the workplace. In this course we debunk some the confidence myths about gender to show we all have confidence in some area of our lives. That confidence itself is situational, and with a bit of practise we can learn the skills to bring more of our naturally confident and authentic selves to the situations where we need it most. Mindfulness has gone mainstream! Suddenly the West has cottoned on to what Eastern philosophies have been saying for millennia – sitting still, doing nothing and clearing our heads is really good for us! Trouble is, like eating 5-a-day, regular exercise and limiting alcohol units, we know we “should” be doing this stuff but how on earth do we find the time to add yet another thing to our already packed schedules? But can practising mindfulness really help us to become better at our jobs? Unconscious bias happens when our brains make incredibly quick assessments of people and situations without us realising. These biases are influenced by our background, cultural environment and personal experiences. This is all totally normal and indeed in many cases very useful. What we learn however is that issues such as gender, age and race bias aren’t the work of nasty consciously biased people, but the consequence of the unconscious programming in both men and women. Therefore the only way to make change happen is for us all to become conscious of and then own our biases. This topic is available as a 2 hour talk or half day training session. Public speaking is routinely rated as one the top phobias, but it is usually a fear of being afraid imprinted as children that keeps us stuck in this unhelpful loop. Having overcome her own fear of public speaking, Michelle introduces some of the science and know-how behind how to overcome this fear to make a possible career derailer into a potential career enabler. This talk won’t cure your fear but might encourage you to sign up for a course of action that will! This topic is available as a half day training session. Developing enough resilience to handle the inevitable failures, criticisms and knock backs we will face in our careers is essential for long-term career success, but all too often this is achieved by building a hard outer shell cutting off feelings and the important lessons they have to offer. In this course we will look at how our individual resilience challenges differ, then utilising a neuroscience approach will develop a personal plan to include a variety of resilience practices. The lack of good mentoring and sponsorship for women are some of the most sited reasons for lack of progress in women’s careers. In a one hour talk, we can look at how mentoring might be different for the genders and how to benefit from the plus points while avoiding the pitfalls. We also look at repercussions of #MeToo on mentoring relationship in the workplace. Mentoring Skills for Mentors and Mentees is also available as practical training course for all genders covering 2 half days over a 3 week period. Business networking is often viewed as one of the dark arts rather than an essential business skill, a hangover from the days of high intensity rehearsed sales pitches. In this course we will take the opposite view, as we believe the most effective way to network is to be yourself with the aim to collect relationships not just cards. What to do when you can’t remember a name! A gallop through 5000+ years of the Patriarchy and how attitudes towards the roles of men and women in society evolved through the 20th Century. Moving on into the 21st Century with the advent of gender fluidity, #MeToo and fourth wave feminism. In this talk we explore how gender equality isn’t a battle to be won by taking sides, but requires each of us to realise what we need to do differently to create a true partnership between the genders at work. Available as a 1 hour talk.